To learn more about The Salvation Army Metropolitan Division, view our recent Annual Report. With a presence in nearly every zip code in America, there is a local Salvation Army near you. There are 28 Corps Community Centers within the Metropolitan Division. To find The Salvation Army in your community, type in your zip code in our location search tool here. 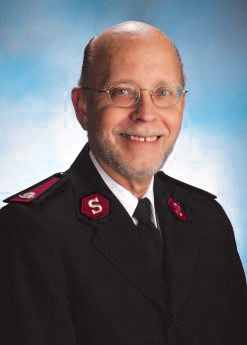 Major David Dalberg is the Director of Emergency Disaster Services and is responsible for overseeing The Salvation Army disaster response throughout the Greater Chicago area including 12 surrounding counties. These responsibilities include being The Army’s EDS liaison to state government and state-wide not-for-profit organizations as well as the City of Chicago’s Fire Department, Police Department, SWAT Team, and Office of Emergency Management & Communications. To receive mobile alerts from The Salvation Army choose from the options below. Once you have received your invitation, reply Y to activate. To find ways to volunteer and support your community, view our disaster services volunteer opportunities. Please contact us at 847-709-6700. If you need additional assistance, The Salvation Army Metropolitan Division's Social Services department can be reached at 773-205-3520 or email us. Someone will contact you within 24 hours, Monday - Friday, 9am - 4pm. Messages received during the weekend will be returned on the first business day. You can also search for services in your community here.